Two facts. First, a strong majority of Mississippians are pro-life. Second, a majority of Mississippians voted against the personhood amendment, which stated: “The term ‘person’ or ‘persons’ shall include every human being from the moment of fertilization, cloning, or the functional equivalent thereof.” Why? Opponents argued that, along with abortion, the amendment would have outlawed birth control and in vitro fertilization, while also preventing doctors from treating women during ectopic pregnancies, even when necessary to save the woman’s life. To begin, let’s review abortion. The legal recognition of personhood for a zygote, embryo, or fetus would not outlaw abortion, just like the legal recognition of personhood for an adult does not outlaw the death penalty. A zygote, just like an adult, is simply a human being at a particular stage of development. The legal recognition of personhood for a zygote, embryo, or fetus would serve the important function of affirming the biological fact that zygotes, embryos, and fetuses are human beings, while bringing all human beings within the scope of the law. Once legally recognized by a state as human beings within the scope of the law, it would then be the responsibility of the state legislature to pass laws dealing with zygotes, embryos, and fetuses as well as laws dealing with children, adolescents, and adults. And since the Supreme Court has already ruled on the issue of abortion (see Roe v. Wade), the state legislature would be limited mainly to dealing with zygotes, embryos, and fetuses on issues concerning tort law and property law. 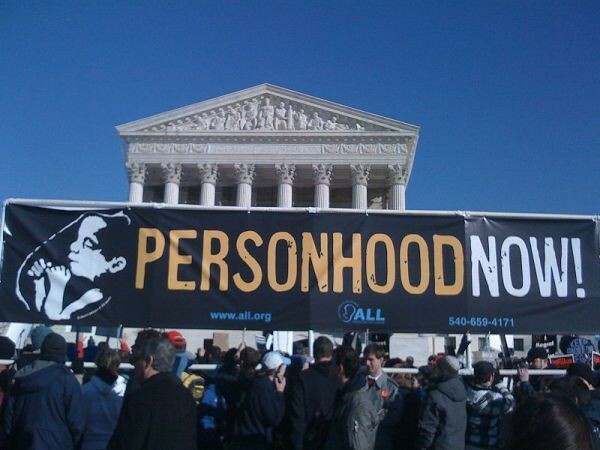 The Supreme Court would possibly, even likely, uphold such a personhood amendment passed by a state legislature (see Webster v. Reproductive Health Services), but the Court, especially the current Court, would also probably uphold Roe v. Wade, preventing a state legislature from using personhood to restrict or prohibit abortion. Of course, if a state legislature wanted to set up a legal challenge to Roe v. Wade right now, it could easily do so by passing a law that restricts or prohibits abortion, without defining a zygote, embryo, or fetus as a person. For example, many believe the fetal pain laws recently passed by state legislatures do just that. And if a future Supreme Court overturns Roe v. Wade without prohibiting abortion (which many consider a plausible scenario), it would then be the responsibility of the state legislatures to either legalize abortion, restrict abortion in certain circumstances, or prohibit abortion. But the recognition of personhood does not prevent a state legislature from either legalizing the death penalty under certain circumstances, or prohibiting the death penalty, and the recognition of personhood would not prevent a state legislature from either legalizing abortion, or restricting abortion in certain circumstances, or prohibiting abortion. Only a Supreme Court ruling that overturns Roe v. Wade while also prohibiting abortion (by whatever argument five or more Justices come up with), or a Human Life Amendment to the U.S. Constitution that overturns Roe v. Wade while also prohibiting abortion (as opposed to a personhood amendment to a state constitution that merely defines every human being as a person), would serve the purpose of prohibiting abortion without the requirement of additional state legislation. Now, along with abortion, the same principles apply to birth control and in vitro fertilization. A personhood amendment, on its own, would not outlaw birth control or in vitro fertilization. And finally, as for ectopic pregnancies, even the legal recognition of a zygote, embryo, or fetus as a person combined with a legal prohibition of abortion would not make it illegal for a doctor to save a woman’s life. So back to Mississippi. Only a few weeks ago, some polls showed that more than 80% of Mississippians supported the personhood amendment. But pro-abortion proponents then succeeded in convincing many pro-life Mississippians (who still want abortion prohibited) that the amendment would also outlaw birth control and in vitro fertilization, while leaving pregnant women to die. Unfortunately, even a highly influential pro-life advocate like Gov. Haley Barbour fell, partially, for these lies. Will such scare tactics work the next time a personhood amendment appears on the ballot in a state?